Serving a taste of the Big Easy in Portland, Cajun and Creole neighborhood restaurant, Acadia, heats up with Gumbo Weekend this week from November 13 - 14. 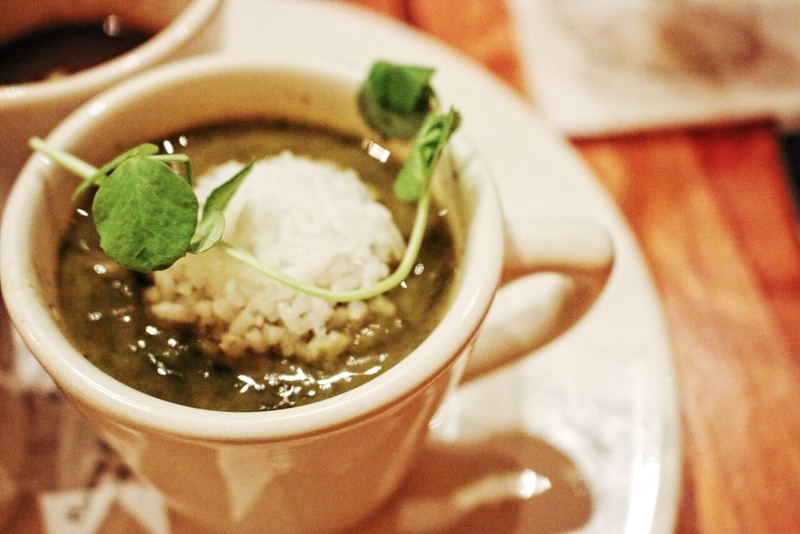 Chef/Owner Seamus Foran will serve a flight of regional Louisiana gumbo in honor of the famous Treme Gumbo Festival. The trio will include: Seafood Gumbo – the classic NOLA gumbo served with shrimp crawfish and Louisiana blue crab; Cajun Gumbo – a southwest Louisiana style with a hearty tomato-based stew, chicken and andouille sausage; and Gumbo Z'herbs – a gumbo popular in southern Louisiana with the Catholic population for it's "Lent-approved" leafy-greens rather than meat-based. Spicy, New Orleans-style comfort food on a stormy night? Sign a girl up. In fact, I had the pleasure of tasting a sneak peek of the Gumbo Weekend menu last Thursday, and let me tell you, the gumbos are pretty tasty. The Cajun Gumbo was my personal favorite. It brought the heat, combining full-bodied cajun flavors with a meaty spoonful of chicken and andouille sausage. When I asked my dining buddy (also known as Dad) which gumbo was his favorite, he stated, "whichever one I'm currently eating." Truly, you can't go wrong. Other highlights from the menu included the Louisiana Barbecue Shrimp for that standout, peppery yet creamy sauce and the Vanilla Bean Bread Pudding with salted whiskey caramel sauce and toasted pecans. Acadia is a cozy space located on NE Fremont, which is quickly becoming one of my favorite off-the-beaten-path foodie streets in Portland. The service here is lovely, the flavors of the dishes are all subtlely spiced, the cocktail menu doesn't kid around with bourbon-heavy pours, and the atmosphere is charming. Gumbo Weekend starts this Friday, November 13 and ends Saturday, November 14. Monday - Saturday 5 - 10 p.m.
Disclosure: A special thank you is due to Acadia for the media sneak peek of Gumbo Weekend! As always, dear readers, all thoughts and views are my own.